Brian paid half a crown (2s 6d) for his mum's washing and a penny to dry it. This launderette is still open. It is now 'Central Wash' 184, Queensway, London. This launderette started a trend. Launderettes opened all over the country. By 1967 there were 4,000 of them in the UK. 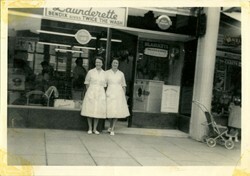 Launderettes were one of the first shops to open 24 hours a day. The 24 hour culture did not please everyone. Sixty-two year old Mrs May Hopkins lived next door to a launderette in Station Road, Gillingham, Kent. In 1966 she complained to Gillingham Council about the noise. Families turned up in their cars at 1am banging their car doors. It was a problem of modern life in the 1960s. Launderettes were popular in the 1960s for two reasons: cost and companionship. Automatic washing machines were expensive in the 1960s. Which? magazine found that there was not much difference in cost between having your own machine and using a launderette. A washing machine was a big outlay. A Hoover Keymatic cost £111 in 1967 (in today's money that is £1300). Washing machines competed with other consumer durables for the family's money. A television was top of the list. About 80% of households had a TV in the 1960s. A fridge came second and a washing machine was third. Washing machines were unreliable. If you took account of the repairs and running costs, washing at home cost from £28 to £43 annually. Washing at a launderette cost from £25 to £31. So it was no wonder people liked launderettes. Launderettes were also popular because people liked to sit and chat while the machines washed their clothes. 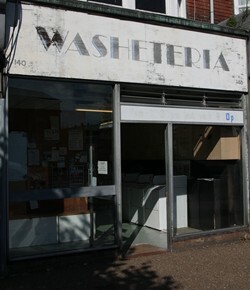 Washeteria, 140 Seaside, Eastbourne. It was Washarama in the 1970s. These machines had bold chrome automotive styling. Do people still use launderettes today? I compared the number of launderettes in Oxford, Eastbourne and Leamington Spa in the 1970s with the numbers today. The number of launderettes has dropped by more than 50%. It dropped in Oxford by 70%. In 1971 there were 21 launderettes in Oxford. Today there are only 6. Launderettes were part of the newly automated life of post war Britain. They are disappearing in today's society. Washing machines are less expensive, so the economics no longer work out.